Beautiful plants and greenery are staples of holiday decorating, but certain traditional plants are toxic if ingested by pets, including mistletoe, holly, poinsettia, and lilies (highly toxic to cats). Keep these decorations out of your pet’s reach or, better yet, opt for artificial varieties. 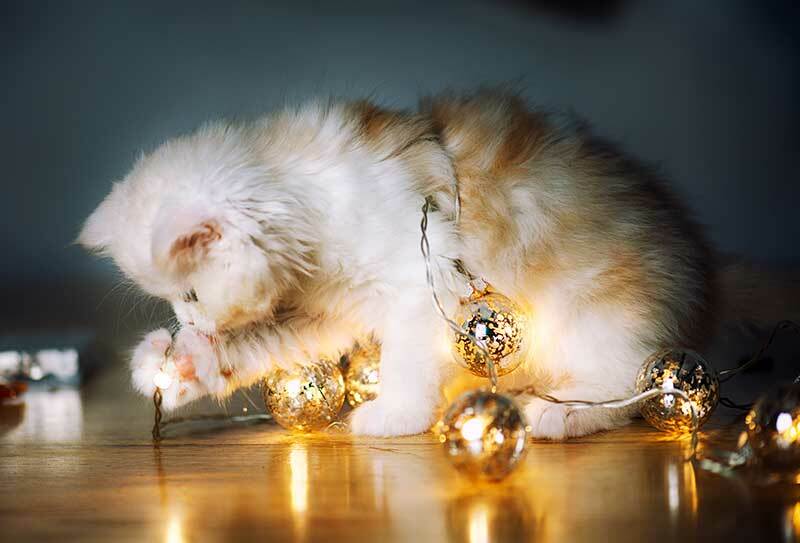 Christmas trees, along with all the dangling baubles and twinkling lights, can be particularly alluring to pets. Make sure your tree is secured or weighted down to prevent a disaster. Also keep pets away from the water at the base of live trees, as this is often filled with pesticides and fire retardants that leach from the tree. The additional noise, change in routine, and general chaos associated with the holiday season can be extremely stressful for some pets. This anxiety can lead to increased opportunities for escape. Make sure your pet is wearing a collar with ID tags at all times, and have your pet microchipped if you haven’t already. Our pets add such joy and love to our lives, but it’s easy to overlook them in all the hustle and bustle of the holidays. Whether it’s a walk through the neighborhood or just sitting quietly together, try to spend a little time each day with your sweet pet. It’s a wonderful way to honor the special bond you share. Please don’t hesitate to contact our team for more information about holiday pet safety! Next: Preparations for a New Pet: What’s the Secret to Backyard Pet Safety?